Getting to Le Bouveret on the Swiss-French border on the south bank of Lac Léman is easy by car, train, or Lake Geneva pleasure boat. Most railway travelers will have to change trains or buses in St Maurice or Aigle while drivers can use the Villeneuve exit from the Autoroute A9. Public transportation from French towns Evian and Thonon-les-Bains is very limited. The main draws in Le Bouveret are the Aquapark water fun park with slides and the Swiss Vapeur Parc with small steam trains. Le Bouveret is a small town on the banks of Lake Geneva at the mouth of the Rhone River. Getting here is simplest by CGN pleasure boat during the summer. Driving is also fairly easy although a few smaller but flat roads are required once off the Autoroute A9. Public transportation is available from all part of Switzerland but very limited from nearby France. Travelers usually have to change to buses in Aigle or trains in St Maurice. Both Le Bouveret’s two top tourist destinations – Aquaparc with its water slides and toboggans, and the Swiss Vapeur Parc with small trains – are worth the slight transportation inconveniences. Le Bouveret is a small town (permanent population around 800) on Lake Geneva near the Swiss-French border. The town is at the mouth of the Rhone River on the southeastern parts of Lac Léman in the canton Valais (Wallis) – Vaud (Waadt) is on the opposite bank of the Rhone. Le Bouveret is on the left (west) bank of the Rhone making road access from the rest of the Swiss Lake Geneva region slightly more complicated. Driving from Evian and Thonon-les-Bains on the other hand is very straight forward. To reach Le Bouveret from the rest of Switzerland, use the Autoroute A9 that runs up the Rhone Valley. For most drivers, the Villeneuve exit gives the easiest access. Follow signs towards Evian or St Gingolph. This route requires crossing the Rhone River on a single-lane bridge at Porte du Scex. Drivers arriving from the Valais Rhone Valley, could also exit the Autoroute at Aigle for an easier crossing of the Rhone (this is also the required route for heavy vehicles over 18 t). 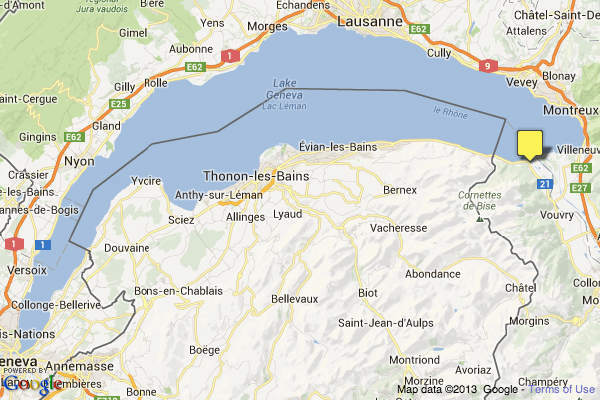 Drivers from Evian and Thonon-les-Bains simply follow the N1005 lakeside road from France into Switzerland. Le Bouveret is only about 4 km from the border post at St Gingolph. CGN Lake Geneva pleasure boats, buses, and trains all provide public transportation options to Le Bouveret in Valais (Wallis). As Le Bouveret is on the “wrong” side of the Rhone River, the town is cut off from the main train line going up the Rhone Valley but quick connections are available. Lake boats are a pleasant option in summer and may even be time competitive on the more direct crossing from Lausanne. Le Bouveret is a year-round stop on CGN Lake Geneva pleasure boat cruises. In summer, boats can call in Bouveret up to ten times per day, during the shoulder seasons (spring & autumn) usually only once per day, and during the winter only on weekends. CGN boat cruising times to Le Bouveret are around 20 minutes to Villeneuve, 30 to Chillon, 40 to Montreux, and 60 to Vevey-Marché. Boat times from Le Bouveret to Lausanne-Ouchy is just over an hour on the more direct route via St Gingolph (12 minutes) and up to two hours when traveling via the Montreux Riviera. Direct boat services are not available from Le Bouveret to French towns such as Evian and Thonon-les-Bains. Travelers from here usually have to cross Lac Léman by ferry to Lausanne and then proceed by boat or train to Le Bouveret. Railway passengers traveling to Le Bouveret usually have to change trains in St Maurice or in Aigle. Mainline trains from Geneva via Lausanne and Montreux all stop in Aigle and St Maurice before traveling further up the Rhone Valley – see Swiss Railways for timetables and tickets. The easier transfer is to change trains in St Maurice. From here, an hourly regional train travels to Le Bouveret in around 24 minutes. This (milk) train usually arrives from Sion but sometimes from as far as Brig and thus offers a direct, if a bit slow, connection to Le Bouveret from the rest of the Rhone Valley in Valais. The alternative is to change in Aigle – actual traveling times are about the same but two further transfers will be needed. Depending on the time of day, the journey is then completed on two buses or two trains. To travel from Aigle to Le Bouveret by train, take the train towards Champéry and alight at Corbier (12 minutes). Walk around 5 minutes down the road to Collombey station and take the train from here to Bouveret (direction St Gingolph) for another 12 minutes. Traveling times by train to Le Bouveret is just over two hours from Geneva, 1h15 from Lausanne, 50 minutes from Montreux, 2h30 from Bern, 3h30 from Zurich, and an hour from Sion. Public transportation from Evian and Thonon-les-Bains to Le Bouveret is very limited. Often, the best option is to take the ferry across Lake Geneva to Lausanne and travel from there by train.